In June, we went to a web accessibility and digital inclusion event and we thought it certainly would be good to focus on this unfavourable subject a bit more than we have done previously. 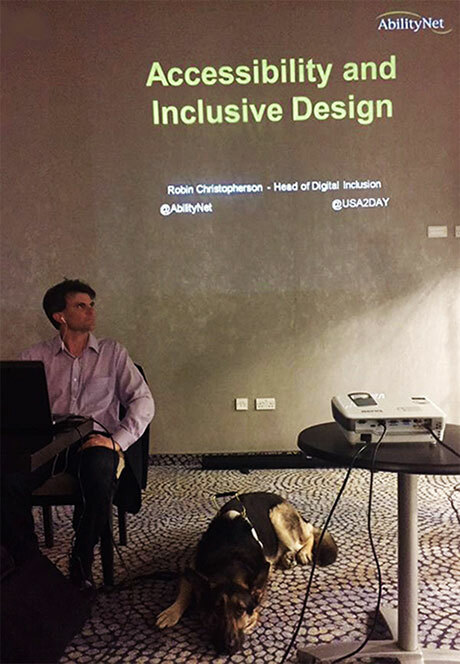 What does it mean for people with disabilities such as Robin Christopherson (in the photo below) who presented the former part of the web accessibility event, Robin made us feel in complete awe; he is blind and he is the Head of Digital Inclusion at AbilityNet. We don’t want to go off on a tangent but that itself is a huge achievement, moving up the career ladder without any disabilities is especially tough when it comes to office politics where ruthlessness does not remit in the formula for success in our opinion. So well done Robin. He started by expressing how difficult it can be with people who have some kind of sight impairment as well as other hearing or motor impairments. This is where assistive technology is very useful indeed to help them comprehend the digital interface content in front of them, and if your website is compliant with web standards it aids them further. However, when it comes to CAPTCHA, known as 'Completely Automated Public Turing test to tell Computers and Humans Apart', which we all have experienced in the digital age. You know those annoying boxes that tell you to type in what you see, obscurely displayed in fonts that overlaps and distorts your viewing ability, even when you have 20/20 vision. Well, we heard it first hand from Robin himself when it comes to assistive technology and reading the CAPTCHA characters is pretty much a killjoy as you can barely hear the muffled out sounds. It was ludicrous by all means. It's definitely a disability discrimination that is seldom taken into consideration. Robin pointed out Google have found a solution to this, reCAPTCHA in a form of a single tick where no need of hearing from the skewed voice or trying to make out the visual fonts. A great start but it will be a long journey before everyone catches on to this seamless barrier on the web - a force to be reckoned with Google's reCAPTCHA slogan 'Tough On Bots, Easy On Humans'. Robin's presentation really stood out as he continued his case for digital inclusion and an accessible web with his guide dog subdued on the floor, yet attentive to his master. We have attended a colossal of digital events and this by far wins hands down. It certainly reinforced the importance of website accessibility more than ever as it's not just for disabled people as per the video below illustrates. As he wrapped up his final words, Robin mentioned he had a wife and two kids - it left us quite choked up and humbled by the end as hope filled the room. "285 million people are estimated to be visually impaired worldwide: 39 million are blind and 246 have low vision."